Cities Connection Project | SUBSIDIZED RESIDENTIAL BUILDINGS. GRAN-SACONNEX. 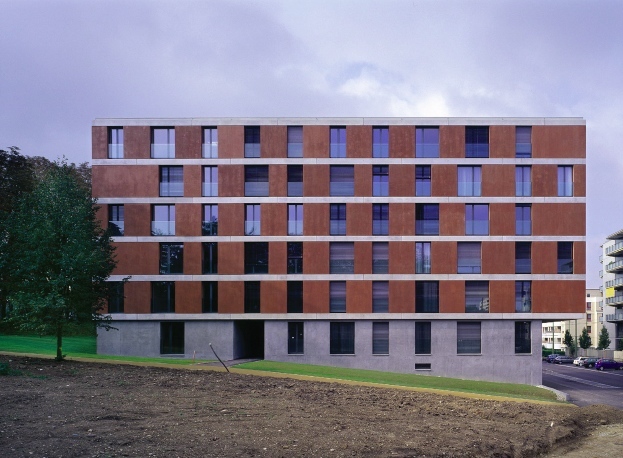 The four buildings were constructed in pairs with council housing subsidies along the Villa Gardiol directly by the entrance to the new Quartier du Pommier. The two building pairs are positioned according to an urban master plan that was produced in advance. They are each oriented towards central open spaces that were created above an underground car park. These plazas are conceived in a way to create a transition zone for the residents between the street and the building entrances. Two solid dyed reinforced concrete bases lie beneath the building cubes and level out the incline of the terrain. They contain car parks and ground floor foyers. Rising above are four parallel residential blocks mainly made of prefabricated building components. They protrude far beyond the bases and thereby create generous covered entrance areas. 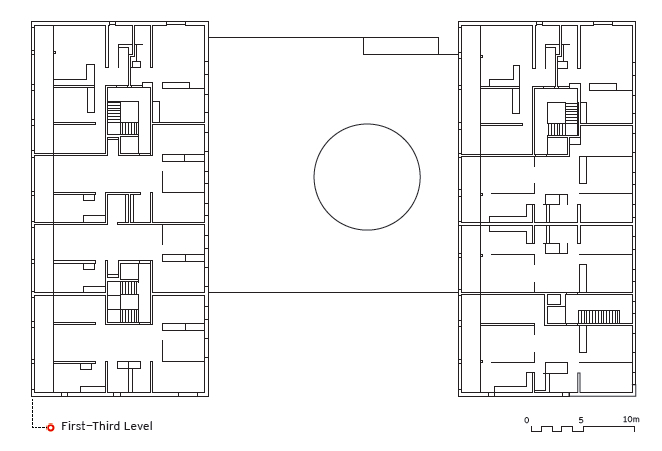 The residential units are aligned around central stairways with skylights. Inside the 17 m deep apartements, large entrées create central entrance zones from which the individual rooms directly lead. Loggias extend the apartements outwards. The concrete of the ground floor bases was moulded on location. The facade construction of the upper floors was built with prefabricated sandwhich elements. They are thoroughly dyed in a rusty red tone and have an irregular surface texture with varying intensity and a changing sheen.